Johannesburg — Radio presenter and DJ Mesh Mapetla has died. Bra Mesh - as he was lovingly known - had an illustrious career that saw him at the helm of well received shows on several stations including Radio Bophuthatswana, Metro FM and more recently Lesedi FM. During his Sunday slot days at the station, jazz lovers would have their ears glued to the radio. In a statement - released on Tuesday - about the DJ's death, The Minister of Arts and Culture Nathi Mthethwa said, "We often do not pay enough tribute to Radio presenters and DJ's for their role in popularising the music we inevitably grow to love. In reality, the role of DJ has historically been an underrated one--a tribe of behind-the-scenes heroes and heroines who continued to shape the direction of music long after they're gone as a contributing force. That is who we are mourning today- a larger than life personality, who has quietly and with great commitment, shaped the way that Jazz enthusiasts have thought about, consumed, and appreciated this special genre of music over the decades." 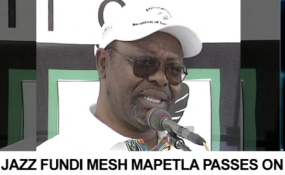 Radio industry veteran Stan Bodibe spoke to The SABC about Bra Mesh.